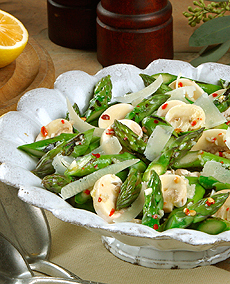 A salad of grilled asparagus and mushrooms with shaved Parmesan a hearty side dish, or a vegetarian main course. Photo courtesy California Asparagus Commission. This salad has become a favorite of ours. We’ve enjoyed marinated mushrooms forever, but the addition of asparagus turns them into a “salad.” The Parmesan cheese on top is a perfect garnish. This is Page 10 of a 12-page article. Jump to the recipe below. Click the black links below to view the other pages. Blanch asparagus in a frying pan large enough to hold asparagus in one layer. Bring approximately 3 inches of water to a boil. Stir in 1 tablespoon salt. Add asparagus. Cook at a medium boil until slightly underdone, about 3 minutes, depending on thickness. Drain on paper towel; cool. To grill, brush asparagus with olive oil. On an outdoor or a stovetop, grill over medium-high heat, turning frequently, until lightly browned and fork tender, about 5 minutes. Lightly season with salt and pepper. Cool. At an angle, cut spears into 1-1/2-inch pieces; reserve. To make vinaigrette, mix lemon juice, garlic, crushed red pepper, and 1/8 teaspoon salt; whisk in oil. Reserve. Recipe can be made ahead to this point. Refrigerate cooled asparagus and vinaigrette, tightly sealed, if serving more than 2 hours later. Return to room temperature before continuing. Slice mushrooms about 1/4-inch thick. Toss mushrooms with reserved asparagus and vinaigrette; arrange on a platter. Add shavings of Parmesan cheese over salad.